I have been thinking a lot lately how technology has changed not only how we learn, but our actual physical learning environment. Years ago we were searching library stacks for research articles, carrying textbooks to every class and writing pen and paper notes for lectures. Now we are using our laptops, tablets and smartphones to research, type notes and even take quizzes/tests. The hours we spend in front of a screen has increased significantly, this places postural strain on the body. It is almost impossible to sit in front of a computer for hours and not experience repetitive strain of the wrists, eyes and neck/upper back muscles. In my career as Registered Massage Therapist (RMT), I see many clients who are experiencing aches and pains from working at a desk for too many hours of the day. A good strategy is to take frequent stretch breaks, however there is only so much we can do to combat the technology posture that is pervasive in our daily routine. There was recently an article on the CBS website that highlighted how bad using your smartphone is for your body as per the image below (Firger, 2014). For every few degrees the head tracks forward and down to read the screen, there is a significant increase in pounds of pressure on the upper back and neck. The muscles then become tight and knotted while the spine can degenerate faster than the normal aging process. Long story short, technology can be tough on our bodies and we need to create strategies for stress relief! The 3240 Media Enhanced learning course has opened my eyes to the plethora of Web 2.0 tools available for teaching. My fellow online classmates have researched and posted on the discussion forum many Web 2.0 sites available for educational use. For example below is a Slide Share that compiles a list of the top 100, so many to chose from! Prior to my careers as a Registered Massage Therapist (RMT) and health sciences teacher, I ran my own personal training business. Essentially I was a teacher, but in a one on one format and specifically for fitness. I met my clients in the gym and created innovative workouts to help them reach their goals. One of the most effective business strategies I used was not how tough the workouts were, but the accountability. I kept in touch with my clients frequently via email, checking in to see how the rest of their week was going and sending motivational tips to stick with their wellness plan. The reward for me was developing that relationship with my client and helping them get stronger and fitter. My client retention was high and I felt the key was the fact I really cared and was passionate about their health. I bring up this story as it relates to the articles posted on the VCC School of Instructor Education Facebook page, links found below. Basically, the new digital degree that is available from higher education centres was proposed to be the next big thing. The articles outline the numbers of students enrolled and how Mass Open Online Courses (MOOCs) are quite popular. They evidence also shows that student attrition rate is quite high, not many actually finish the courses. I feel a big component missing is the student accountability. Without a teacher knowing you by name and checking in if you are doing your homework, it would be difficult to stay motivated. As teachers we are guides to our students, helping them along the learning process. Without that personalized attention the students may lose interest and drop out. There is a human factor to learning in school, similar to reaching your fitness goals with a personal trainer! Isreal, S. (2009). Twitterville: How Businesses Can Thrive in the new Global Neighbourhoods. New York, Pengiun Group. I have been struggling with a dilemma, my social media branding has become muddled. I am pursuing the Provincial Instructor Diploma Program (PIDP) through VCC for my career as a health sciences instructor as Vancouver College of Massage Therapy (VCMT), of Utopia Academy. The problem is that my primary career is running my own Registered Massage Therapy (RMT) business. These are not mutually exclusive and do compliment each other very well, except when it comes to my online presence. I have done research into social media marketing and the most important message is to be consistent and clear with your brand. A quick google search and you could be confused why Barb Tyers RMT is tweeting about new learning technologies, or Facebook posting about Web 2.0 learning tools, or blogging about classroom dynamics. My message has become muddled with the different roles I am playing, unfortunately I feel my RMT business may be suffering. At this point I am willing to lose marks in the 3240 course to try to stick with my goals as a sole proprietor providing massage therapy as my main career. I will continue to fulfill my requirements for the 3240 Media Enhanced Learning assignments, however when the course is done I need to clean up my social media message and this blog will become private. Below is a link to my real blog for my RMT business, thanks for your support and understanding! The main focus of 3240, Media Enhanced Learning, is implementing technologies into the teaching environment. This blog post is not exploring a specific technology, but a reflection on a link that was posted to the VCC School of Instructor Education (SIE) Facebook page. Everyday I scan the latest posts and read the links, this one in particular caught my eye as a basic lesson in how to capture your student’s attention http://www.teachthought.com/literacy-2/30-storytelling-tips-for-teachers/ There are quite a few fantastic tips, I would like to highlight a few I feel are applicable to adult learner environments: Create a hook in your opening to gain their attention; Keep it simple; Use pauses; Finish your story strong with an important take away message; Make sure the story is relatable/realistic; Avoid tangents; Do not give away everything. Why this blog post resonated with me is that I frequently incorporate case studies into my lesson plans. I am adept at using a relevant case study from a real life example or made up, however it is the delivery that I need to improve on. Case studies are an excellent tool for creating a story that students must analyze and critically think to come up with a solution. Developing my skills as an effective case study storyteller could enhance students engagement. 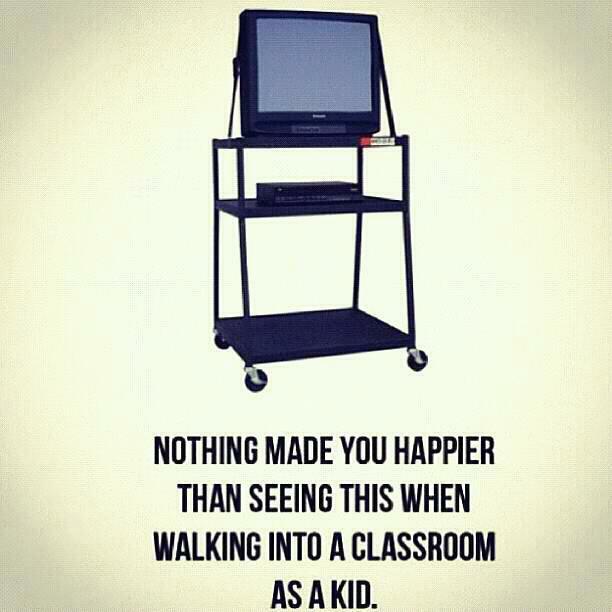 I remember when the teacher would roll in a TV and VCR trolley for the class, it was considered the newest technology! There has been many changes and improvements in institutional media through the years. We have progressed from overhead projectors to white boards to power point presentations, and now all of the new interactive technologies. Online learning management system forums, in class clickers and polling, instructional games, social media applications….there are so many new fancy options! Using technology should have a purpose, not just using the fantastic new media tool for the sake of using something fancy. Appropriate to the level of learning and relevance to the course objective are key points. Always keeping in mind the goal of engaging students and fostering critical thinking with interactive technology, versus passively watching a video. There are so many possibilities to enhance your teaching with instructional media, I continue to learn through the 3240 discussion forums of what is available out there!